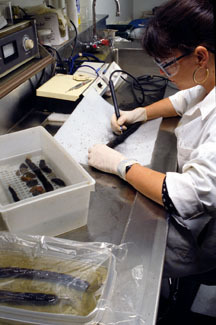 Conservator at the Canadian Conservation Center, Quebec, preserving rope from a shipwreck site. Photo courtesy Canadian Conservation Center. The practice of underwater archaeology is truly interdisciplinary, combining the methods of various allied fields of study including anthropology, chemistry, ethnography, geology, history, naval architecture, oceanography, and paleography — to name only a few. 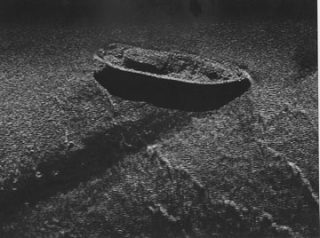 Although much underwater archaeology is conducted with standard scuba equipment, using simple measuring, mapping, and drawing techniques, archaeologists have borrowed special methods for working in the underwater environment from marine science as well as commercial and military diving. Technologically sophisticated projects use both acoustic and magnetic remote-sensing equipment for detecting underwater archaeological sites, and acoustic, optical, infrared, and robotic methods for pinpointing, mapping, and documenting sites. Monitor side scan sonar, 100m. Photo courtesy Robert Church, C&C Technologies, Inc.